Can I Break Free From My Parents' Financial Mistakes? The way your parents handled their money is going to affect the way that you handle yours and not always in the ways that you think. It is important to realize that your parents’ mistakes do not have to be your own. Additionally, unless you are careful, you may not benefit from the successful way that your parents managed their money while you were growing up. It is important to take time to really think about how to handle your money and how your family history affects you. One of the most common things that is passed from generation to generation are bad financial habits. These habits may be things like failing to save money, failing to budget or relying on credit cards too much. If you have parents with these habits, you should be able to recognize both the habits and the consequence of these actions. It is important to realize that unless you do something differently from your parents, you will have the same consequence. 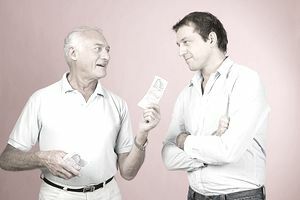 It is also important to realize that while your parents’ poor money habits may affect you through the way you handle your money, you are not responsible for paying back their debts as long as you do not cosign a loan with them. If you have parents with too much debt, avoid being a signer on their credit cards and other loans. When they die, their estate will cover the debts, and anything left over will be forgiven. If you sign, you will be held responsible. Also avoid taking out a loan for them to help them out of a bad situation. Another way that your family may affect your finances is if you felt deprived as a child. If your parents were very careful and frugal with their money, you may have felt deprived over the years. Some people unconsciously compensate for this by buying things to make up for it. This is can be a tricky one to spot, but the best way to judge this is if you are relying on your credit cards and failing to save money each month. If you can afford nice things, you can buy them with no guilt, but only if you can really afford it. Make sure you are not selling yourself short by buying things that will satisfy you in the short term, but leave you in a bad financial situation later. One of the biggest things that is passed from generation to generation is financial knowledge. If your parents regularly invested in the stock market, chances are they talked to you about it, and you learned what and how to invest. However if your parents did not invest, you may lack the knowledge or confidence to invest on your own. Fortunately, this is easily remedied by doing research and talking to professionals who can help you begin investing. You can find a mentor in your community that may be able to help, as well. It is completely possible to break free of a bad financial family history. You need to be very conscious about how you handle your money and take the time to set up a solid financial plan now. A budget and specific financial goals can help you stay on track and take the steps to begin building wealth. If you do not create a plan and specific goals with actionable steps, you will likely flounder and you may slip into the habits or patterns that you learned as a child. It is important to realize that you need to keep moving forward, because you can recover from most financial mistakes. If you have children, you can teach them what you learn and pass good financial habits for your children. Make sure you teach them these nine financial skills before they graduate from high school. Do You Need Help for Spending Issues?